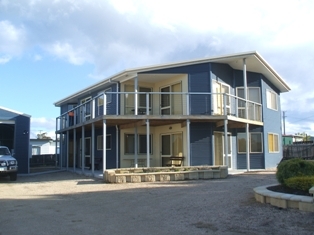 St Helens on the Bay is a fully self-contained complex of 2 units, each comprising of 3 double bedrooms (ensuite and walk-in robe in main room). 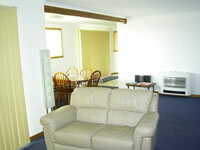 Both units have separate bathroom, toilet, lounge/dining, kitchen and laundry with full washing facilities. All linen supplied. 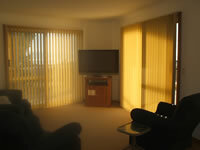 The top unit has a large deck overlooking George’s Bay. These units are suited to small groups, families and couples wishing to have privacy and are also suited to people wishing to have a fishing or boating holiday. 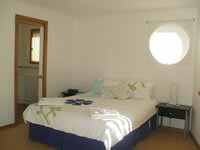 There is also a large lockable garage which will accommodate up to a 6 metre boat. 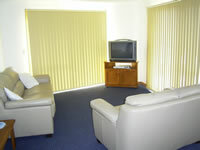 Facilities close by include caravan park shop with hot food and fishing charter contacts. 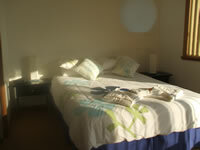 Main bedroom contains 1 queen bed, ensuite & walk-in robe, electric blankets provided for all queen beds, hair dryer. 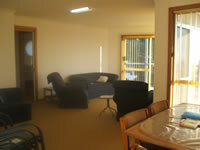 Door opening out onto deck with views of Georges Bay. 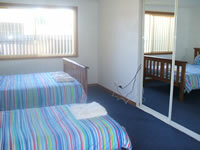 Bedroom 2 contains 1 double bed + 1 single bed large built in wardrobe. Bedroom three 1 queen bed + 1 single bed built in robe small TV & video. 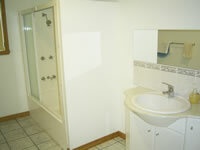 Separate toilet and separate bathroom with bath, shower facility. 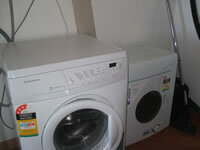 Full laundry - washing machine, dryer, iron, ironing board. 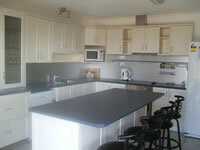 Full kitchen with walk-in pantry, large side by side fridge-freezer, dishwasher, separate dining opening to lounge room. Large Plasma 42” TV + DVD, opening out on a large deck. BBQ for use on the deck. Electric heating with options for fan, element & heat and timer settings. 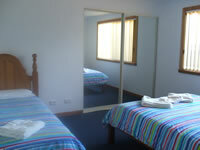 Main bedroom contains 1 queen bed plus ensuite and walk-in robe, hair dryer electric blankets for all queen beds. Bedroom 2 has a queen bed plus 1 single bed built-in robe bedroom 3 has 1 queen bed plus 1 single bed and 1 single roll out trundle, built-in robe. TV, DVD. Separate toilet, separate bathroom with bath shower facility. Full laundry with washer, dryer plus ironing board and iron. 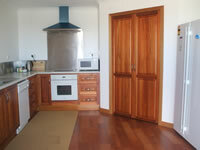 Full kitchen facilities with kitchen breakfast bar, double fridge freezer, radio, dishwasher. Dining room, lounge opening out to an outdoor area, bbq. Most suitable for families with small children and toddlers. Supplied - tea, coffee, sugar. NO FRESH MILK SUPPLIED. Porta-cot available for hire. Local convenience store carries hot foods only two doors away.